This site is about my outlook on life, what I see and feel, posting blogs about cats, cancer, life, tech, the world, the universe and The Sweet! For years I have wanted to start this adventure, but life, work and other obstacles always seemed to appear in my way as I attempted to start venturing in this creative world. Now I have finally managed to step into this cyberspace of writing and I hope this will become an amazing voyage of wonderful discovery. My time is limited but every so often I hope to add a little something to my little corner of this world wide web. 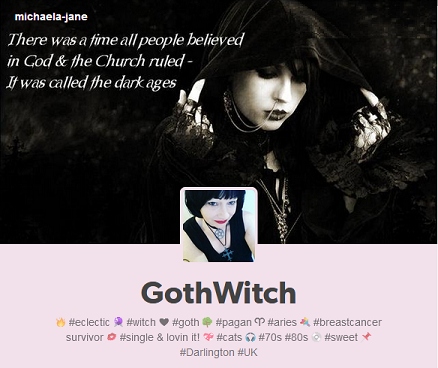 "A Wicca maybe a Witch but not all Witches are Wicca"
I am a Witch but I am not a Wicca, I do NOT follow the Rede. Everyone is different. That is what makes this world such a wonderful place. So many different thoughts and ideas around, welcome to my little corner. There are so many paths for the Pagan to walk, knowledge is at the heart of everything we know. My site is to help others starting out on their journey to find thier own unique individual apth. I have a name that I love, but I also have a name that most people pronounce wrong. My name is Mee-ki-la, it is NOT Me-KAY-la! 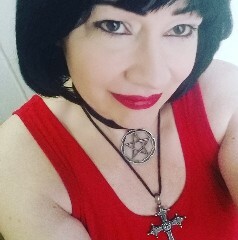 I am a Pagan Eclectic Witch, a Goth, website hobbiest, part time casual blogger and gamer who loves cats, books, tech, life, the world, the universe and The Sweet!! I am in my mid 50s and a single mother of a wonderful son who is my world. When I say single, I mean it in every sense. I have never been married, nor have I lived with anyone, something I have never regretted. In fact it has made me stronger in my life and it gave me an amazing opportunity to bring my son up in a very stable, quiet and calmer home environment than I ever had. I live in the back-end of nowhere called Darlington in the North of England but I have lived all around the UK including Swansea, York and Great Yarmouth. I walk most places, further travel is done by bus or train. I have a clean full driving licence but do not own a car. So expensive now! Anyway this way is healthier, better for my pocket and the environment. Plus I love a boogy to my mp3 player as I walk! I love reading, I love watching documentaries about the Earth and the Universe. I love gadgets and computers, messing with my websites, my tablet and rooted Galaxy Note 3! I built my first computer from a page I printed from the internet. It ran windows 95. It was a huge the upgrade from my old Amiga 1200 (which actually I still really do still miss!). Cats are my passion though. Love them. Always have. I got to choose my first about aged 7, a ginger tom I called Tiger. In fact my first 3 cats were ginger toms called Tiger. Each came from York cat shelter. Then I got 2, then 3. I would have as many as I could but life wont allow me so I have 1 child and 5 cats. in 2016 I joined the many thousands of people who fought the battle of their life. I was diagnosed with Breast Cancer. I survived. It has changed me and how I now look out upon the world. Update - It is now 2018 and I have just been diagnosed with bone cancer. The fight goes on. © 2018 - michaela-jane.com. All Rights Reserved.